The UK’s response to the flooding crisis must centre on a long-term strategy to address climate change the Green Party says today, as it recommends a series of ten measures to improve the country’s flood resilience in future. It says sustained political action on climate change is crucial to reducing the risk of severe flooding happening again. The Party is calling for Environment Secretary Owen Paterson to be sacked and for the Prime Minister to remove Cabinet Ministers and senior government officials who refuse to accept the scientific consensus on climate change. 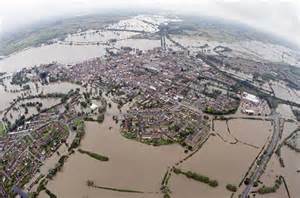 The Met Office has said (2) that the evidence points to climate change contributing to these extraordinary floods. “These floods, which are now affecting thousands across my constituency, bring into focus the devastating risk of inaction on climate change. 2. Strengthen planning rules for urban and rural areas to prevent further development on flood plains and ensure developers prioritise flood resilience and prevention – including through incorporation of SUDS in new developments as well as a programme of retrofitting SUDS to existing communities. Ensure better transparency of decisions so public can hold decision makers accountable. “Across the country, homes and businesses are being devastated by the floods, and our hearts go out to everyone whose life is being turned upside down. Nature is giving us another wake-up call. The call to government urges ministers to adopt the recommendations of a major independent cross sector coalition for a Cabinet-level committee on infrastructure and climate change resilience and a Royal Commission on the long-term impacts of climate change on land. The Green Party is also calling for all staff cuts at the Environment Agency to be cancelled, planning rules to be strengthened to prevent further development on flood plains, and for increased levels of spending on flood defences to a level in line with expert recommendations from the Environment Agency and the Climate Change Committee. “This redirection will address the underspend and assist the victims of flooding, as well as putting a halt to public money exacerbating the problem of climate change that is making the floods so much worse”, noted Bennett. This entry was posted in National News and tagged Caroline Lucas, Green Party Leader, Green party: 10 Point Flood Prevention Plan, Keith Taylor, Natalie Bennett, retrofitting SUDS, Reverse staff cuts at the Environment Agency, Strengthen planning rules, the Green Party by tamesidegreens. Bookmark the permalink.